Mission Murals by Philz's Coffee, San Francisco, originally uploaded by cproppe. Had to share just one more from today's visit to the Mission to see the murals .... This is right next to famous Philz's coffee on 24th; the line was out the door, so I did not partake, but I will go back. 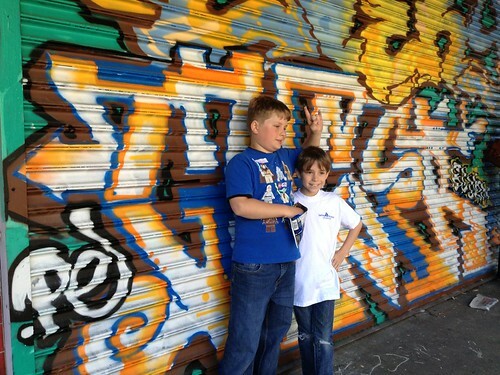 The boys loved the colorful grafitti art next door. Excellent colors! To learn all about Balmy Alley + the Mission murals, read all about our visit in my previous post, here. To see all our mural pics on Flickr, click here! Crossing the Chasm: My Lean in Story!